Should your podcast be audio, or video? 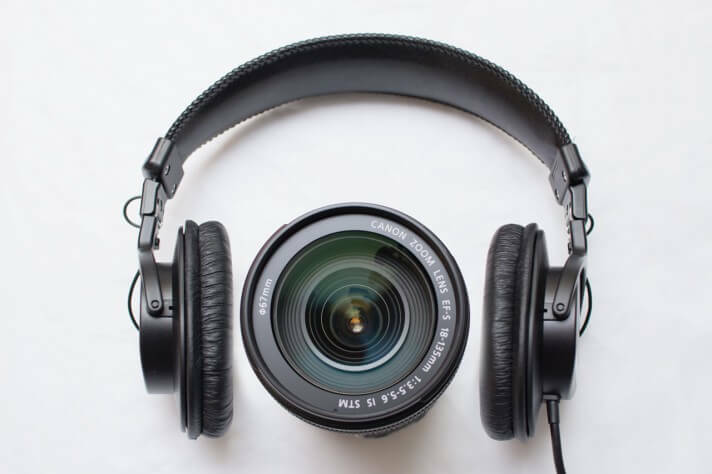 Whether you're a new or experienced podcaster, you may face the decision of whether to be in audio or video podcasting. Here are the pros and cons of each format, and things you should consider. I'm omitting “enhanced AAC” because it's a quickly dying format with limited compatibility and few practical needs that can't be met with effective show notes. This topic was inspired by Steve Hart's feedback. Do you know of any research that helps establish if people prefer video podcasts over audio only podcasts? My feeling is that people are more likely to listen than watch, particularly if the video only features ‘talking heads'. Would be interested to see any stats or research into this area. The most powerful thing about audio podcasting is how easy audio is to consume in various environments. You can listen to podcasts while cooking, driving, playing games, mowing the yard, and even working. It's easy to listen to one thing while doing another. The Audio Technica ATR2100-USB (Amazon.com | B&H) is only $50 and produces acceptable quality for any audio podcast. You can plug it straight into your computer (or many mobile devices) to record without expensive equipment. If you can cut, copy, paste, and delete text on your computer, then you can edit audio! It's easy to remove sections you don't want, and clean up dialog without leaving any noticeable signs of editing. Only six out of the top one hundred podcasts in iTunes (as of March 3, 2014) were video. Even Leo Laporte's This Week in Tech has only the audio edition in the top 100, but not the video edition. This, alone, doesn't mean it's the best option, just that more top podcasters chose audio, or their audio formats are more popular. You can play MP3 audio files on almost any device or media app. Even old flip phones can playback MP3! There are several apps that support audio and video podcasts, but many popular apps (such as Stitcher, TuneIn, and iHeartRadio) support only audio. It's hard to make audio go viral. Some media hosts, such as SoundCloud and Audioboo, have partnered with Twitter or Facebook to automatically embed media players for direct links to media files. Aside from these couple exceptions, audio is far less common for sharing or embedding. Audio can't be consumed by the hearing-impaired. You can help this by having your episodes transcribed, or by writing great show notes (my recommendation). Try to review paintings in audio, describe a beautiful scene, or train on software or hardware. While these are all possible to do, if you can communicate well, they take a lot more work and time than simply showing something. This is why nearly all of my one-on-one consulting sessions involve video (webcam or screenshare). Many people want to be on YouTube because it's a massive social network and even a search engine of its own. It's possible for you to publish your audio to YouTube with just your cover art or a slide presentation. This kind of “hacking the system” it's far less effective and will probably turn away potential a potential audience. When you go to a website with an embedded video, you know what to do with that video. It's often more compelling to click play on the video than to read through the written content. This is a problem that can be helped in audio podcasting, but it needs more support. Video also makes the easy things even easier to communicate. Instead of saying, “Email feedback at My Awesome Podcast dot com,” you can just say, “Email me,” and display the email address on the screen. We're humans and we relate with other humans. Showing your face in video allows your audience to get to know you even better than just hearing your voice. They can see your expressions, read emotions, and learn to recognize your appearance. This can result in more engagement. YouTube is social network of its own. I think the quality and usability of comments has increased since Google+ was integrated. Being on YouTube can help you reach a whole new audience. When you upload your videos to YouTube, they can live there forever without any foreseeable hosting expenses. You even have the opportunity to monetize your videos more easily on YouTube than finding a sponsor for your show. Many people will even search YouTube for things before they search Google. Being on YouTube also gives you more opportunities to appear on the first page (and higher position) in Google search results. Because publishing video lets you get onto other platforms and be more shareable, you'll find a larger “longtail” for video content than audio. “Longtail” is how much your media is consumed over time. The timelessness of your content greatly affects this. I see many of my YouTube videos continue to receive more weekly views than their equivalent audio podcast episodes. Getting good video means you need a great microphone (which should not get in the way of your face), good lighting, and decent camera—in that order. Even with cheap options for each of these needs, you'll still spend several times more for video than audio. Editing video is a lot more complicated than audio. You need to learn about color correction, composition, video codecs, resolutions, frame rates, and more. In video, it's not good to try removing every verbal crutch because this leaves noticeable edit points in your production. You can sometimes cover these up with B-roll footage (other relevant video or images, such as a second shot of the product you're reviewing), but this means more stuff you have to find or record. Watch how I use my own B-roll footage to cover up my edit points in my review of the Electro Voice RE20 microphone. Try watching a video while driving, mowing the hard, or using deadly cooking utensils. Actually, don't. I want you to stay alive with all your body parts. Watching video requires a lot more attention than audio. This is a good reason to keep Internet videos short, so that it's easy for your audience to watch the whole thing without the commitment they'd have to give a movie or TV show. Many new and popular podcast apps don't support video podcasts. Stitcher, iHeartRadio, and TuneIn are just a few. But it does seem like a growing trend. In-car entertainment is also likely to support only audio for driver safety. Why did you choose your format? What made you choose audio or video? If you publish both, what kinds of growth do you see for either format. Podertainment magazine is now available! Daniel, What are your thoughts on using something like google hangouts then using the audio file of that to load up as an audio podcast feed? Seems like you would get the benefit of both having the flexibility for your audio listeners, but could also use the video on the show notes page to provide the ranking/SEO benefits that comes with having video. Especially since it seems that google hangouts increase your authorship ranking (so I’ve heard). I’m on the verge of starting a podcast and I’m teetering on whether I should just do the audio or go the hangouts route. The podcast would be 100% interviews. Thanks. Yes, that can be a great thing! But with any interviews, especially those that are PC-to-PC, you need to ensure that the interviewee has quality equipment and wears headphones. They should at least not be using their built-in mic. Thanks Daniel. I decided to go with just audio. Makes it much easier on the guest so they don’t have to worry about messing with hangouts and in case they can’t be by the computer. Also for a long interview, it’s a little weird being on camera that long. By the way, just recently listened to you on EOFire! Great interview. I have tried this, the only problem I have with it is that Google Hangouts can be very dodgy – it cuts out and even had the problem of it actually uploading. Also you dont get views on Google Hangout Videos. Definitely the cheapest way to do it though. Agreed. Just audio seems to be a lot simpler and more reliable. Might try some video in the future, but decided to just use the skype audio and record with ECamm. Seems to work pretty well. Thanks for the input. I use Zoom.US for live video using a USB 3.0 webcam (HoverCam 3PO), Blue Yeti mic and a headset for one on one interviews. The software records in both video and audio. I post the audio on my site for free and rent the video thru Pivotshare. It also allows up to 25 panelists in a video format – check it out!! Nice! I recently launched a video podcast, purely for the fact that I seem to do better on camera than in an audio format. I’ve been second guessing this decision, because the audio format seems more accessible. I am still adjusting the tech side of things, but I’m wondering about releasing audio files with each video podcast. Is that possible? I haven’t looked into it at all, just curious. I guess i could do episode 1 and episode 1.5? Or, maybe a separate feed all together, but that might get confusing. I really suggest having only a single feed in iTunes. If you want to publish videos, I suggest you put those on YouTube and the audio in iTunes. Just ensure that your content is consumable by audio. So show and describe. Thanks for the reply 🙂 I have it in iTunes and on Facebook. Maybe I should switch to an audio format in iTunes? Hmmmm… Something to think about. Whatever you do, I recommend that you not mix formats in a feed. Posting a true video (not simply a logo with your audio track) can be a good way of reaching an additional audience on YouTube. But the attention span on YouTube is quite short, especially for talking-head video. Hi Daniel, this article really cleared up which platform I should use first for my blog. I wasn’t sure if I should start with youtube or podcasting first. After reading your article, it makes more sense for me to start with a podcast since I am not that technical with computer editing software. Thank you for this article! I use both YouTube and Soundcloud/iTunes for my stories because each area has their own market. Well, youtube did until they started to censor horror stories 🙁 Now I am going to turn off all advertising on YouTube and refer people to my website for videos so they can be a part of the advertising there where I sell Halloween costumes and horror movie packs. Great blog post, Daniel. It and the tortuous help pages at Apple were a great aid in my decision to limit my audio content to stuff i do not mind distributing for free. Video content, as in lectures, will have to be saved for monetized YouTube, Apple TV, and possibly my own paywall-protected delivery app, if I care to develop such a thing.